Call him the space guitar hero: An astronaut living in orbit has penned a musical ode to Earth in what he's billing as the first original song recorded on the International Space Station. The song, called "Jewel in the Night," is a holiday-themed tune recorded by Canadian astronaut Chris Hadfield just days after arriving at the space station last week, just in time for Christmas. Hadfield and two crewmates docked at the space station on Friday, Dec. 21. On Sunday (Dec. 23), he recorded the tune and then posted it online on Christmas Eve (Dec. 24) via YouTube, Twitter and soundcloud.com. And offer goodwill to men. It's come round to Christmas again. Canadian astronaut Chris Hadfield strums a Larrivée Parlor acoustic guitar similar to the one he will use aboard the International Space Station when he commands orbiting laboratory in 2013 during the Expedition 35 mission. Hadfield, 53, is a veteran astronaut with the Canadian Space Agency and currently serves as a flight engineer with the station's current Expedition 34 crew. He will be the first Canadian space station commander when he takes charge of the outpost's Expedition 35 phase next year. Music has a special place in Hadfield's heart and is among his passions. Before launch, he had a special guitar pick made to resemble his Expedition 35 mission patch. A close-up of the cosmic guitar pick to be used by Canadian astronaut Chris Hadfield during his Expedition 35 mission to the International Space Station in late 2012 and early 2013. The pick resembles Hadfield's Expedition 35 mission patch. "I play guitar in a couple bands and sing. I've fronted bands here in Houston for 20 years, and it's just a natural extension for me to play music no matter where I am, whether it's at Star City or Tsukuba, Japan, or on board the space station; I played guitar on board Mir when I was there back in 1995," Hadfield said in a preflight NASA interview. "I thought, since I'm there long enough; why not write music about the experience of traveling in space." Hadfield said that early pioneers, sailors and miners all created songs about the exploration of new frontiers on Earth. So it is only natural for the tradition to continue as humanity expands into the cosmos. 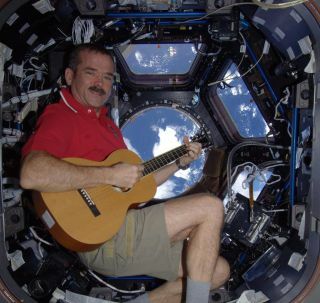 Since arriving at the International Space Station this month, Hadfield has posted several photos of the guitar he is using and himself playing music in space. On Christmas Day, he strummed the guitar as his five Expedition 34 crewmates (two Americans and three Russians) serenaded Mission Control flight controllers with traditional Christmas carols. "I'm not by any means the world's best musician, but I love it and I’ve had lots of people to play music with," said Hadfield, who will return to Earth in May 2013. "To be able to do that on space station is fairly new in the human experience and I want to make the most of it."